1. Find the online storage source that works for you. a. Cloud-drives: those places in cyberpace that store everything for you and allows you to access from anywhere in the world (e.g., Google Drive, Dropbox). You can also upload items here and grant permission to certain users. JUGs co-authors are a HUGE fan and we use it on the reg! a. Do you really need to save every paper you wrote in college? NO. Delete these files since they just crowd the space on your hard/cloud drive or back up to an external hard drive if you can't part with your senior thesis that owned your life as an undergrad. 3. Organize your email and curb those subscriptions! 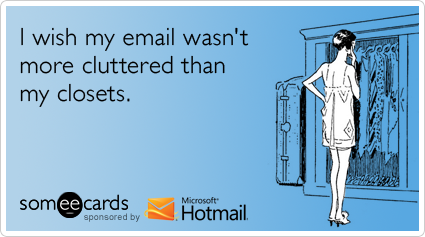 a. Unroll.me is an amazing tool that automatically senses and filters emails for you to declutter your inbox. Online subscriptions (huge problem of mine!) as well as those detected to be from sources aside from your mail contacts quickly disappear from your inbox and archive for you to weed out later. You can review subscriptions in summary and decide which you do not need to waste valueable time with anymore. I've used this for over a month now, and it is amazing how less annoying email has been for me! 4. Simply social media using hootsuite, a platform that manages main social media networks (e.g., twitter, facebook, linked in, etc.) in one simple dashboard. No more going back-and-forth to various apps, using more battery life on your laptop/phone/iPad! JUGs challenge: Try to integrate at least one of the above sources into your digital life. We'd love to hear how you have simplified! Any other resources not mentioned that you'd recommend to other gals? p.s. Stay posted for another spring cleaning post in the coming weeks!